Peter at the head of the pack during the "Hell-In" event. Peter Egyed is one of the most consistent CrossFit competitors in the field. Peter, owner of CrossFit Fury, has performed well in every year of CrossFit Games competition beginning with the inaugural event in 2007. His sixth place finish at the 2009 Games gave him the opportunity to sit out sectionals in ’10, advancing straight to the Southwest Regional, which he won handily. 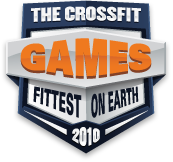 During the 2010 CrossFit Games Sevan Matossian caught up with the humble competitor from Avondale, Ariz., for a quick interview. Peter is the most consistent crossfitter out there!!! Before anyone argues look at the final placing in the games for the years past. Awesome job Peter and wish you got more love from the "crossfit world" you are a true inspiration to many, and you do it the right way! 05 August 2010 / 9:04 p.m.
definitely one of my favourite athletes out there, extremely consistant and he keeps improving!! 06 August 2010 / 1:16 a.m.